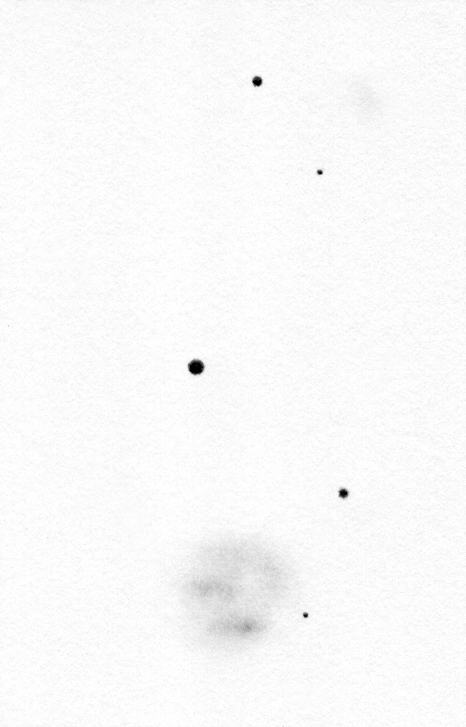 NGC 2537 drawing inverted into positive. NGC 2537 a.k.a. the Bear Paw Galaxy is a surprisingly interesting object in the constellation of Lynx. This is a barred spiral or rather a blue compact dwarf galaxy with a completely unique shape. It is a relatively close system about 22 milion light years away from us. Based on its peculiar appearance one could think that the bear paw / horseshoe / turn-on-button shape of the galaxy is a result of an interaction. 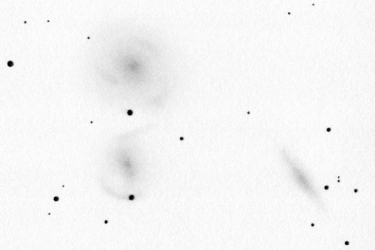 But the measurements show that this dwarf galaxy evolves in a rather isolated position. There seems to be no dynamic connection with the seemingly nearby IC 2233. 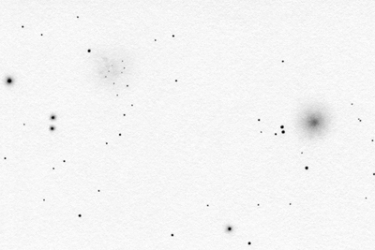 No signs of recent merger activity have been found in NGC 2537 either. 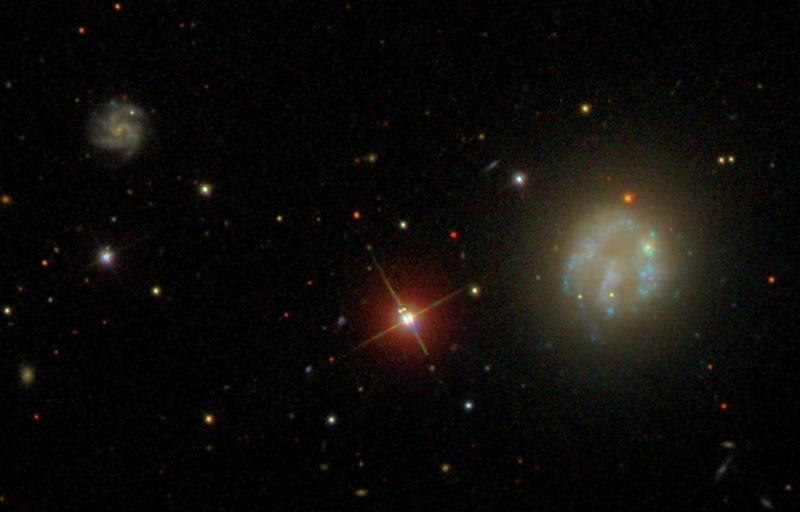 The galaxy is surrounded by a neutral hydrogen (HI) halo increasing its size 6-8 times. The measurements indicate strong mass consentration in the center. 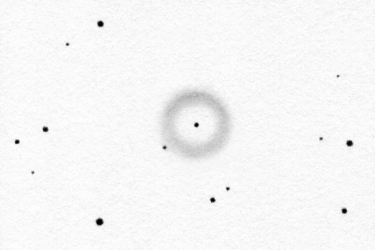 But no real core is visible neither in the photos nor in the telescope. 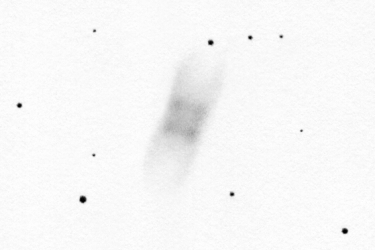 The Bear Paw Galaxy is a very rewarding sight: a lot of details are visible in the eyepiece. Actually almost everything that the photos show. These were comfirmed by a few fellow observers, friends of mine. 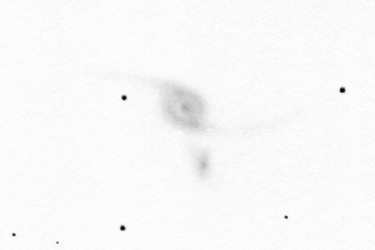 The brightest spot of the galaxy is a star forming region just like all the other bright spots and arcs. I could describe the details e.g. the inhomogenities of the "bar" but everything is visible in the drawing. 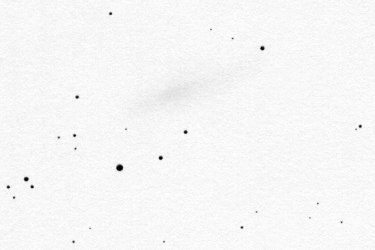 Another object could be seen nearby: the extremely faint (15.4m) and detailless background galaxy NGC 2537A (PGC 23057). NGC 2537 is included in Halton Arp's catalog as Arp 6 as a low surface brightness spiral galaxy. 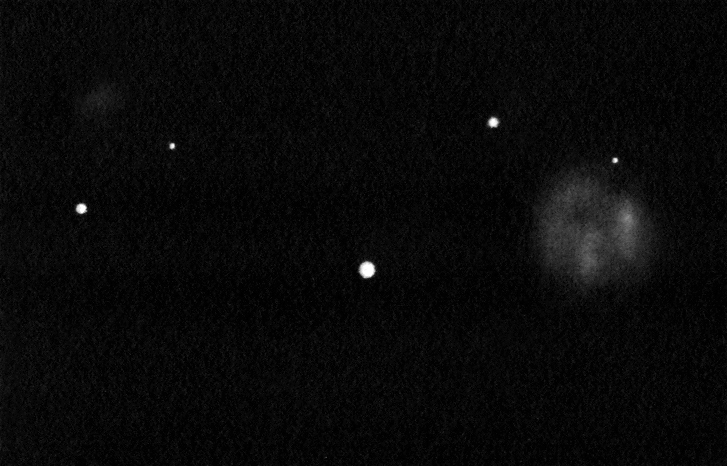 The SDSS (Sloan Digital Sky Survey) photograph of NGC 2537 can be seen to the left made with the 2.5m telescope. I rotated and cropped the photograph so that it can directly be compared to my inverted drawing.